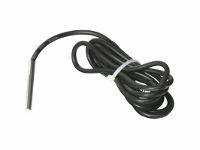 The S-T measures the temperature by use of a glass packed thermistor with a negative temperature coefficient (NTC). Its resistance changes according to the temperature. The change follows a specified curve.